To begin this crochet pumpkin you will need to have your pumpkin stem on hand. If not already, make sure that the pumpkin stem is cleaned and dried. Depending on the size of the base of your pumpkin stem the beginning portion may differ. I will begin the steps until a common number of sc can be achieved using multiples of 6 for stitch count (for example 12 stitches, 18 stitches, 24 stitches etc). Let’s start off step by step! I was able to achieve 12 ch st around the base of the stem. Your stem may differ in the amount you are able to chain. That’s okay! Sl st your beginning ch to your final ch to secure a tight loop around the stem. Step 2: Continue to hold your ch stitches in place around the stem. You will now begin to sc a round around the piece. Step 3: Still working around the pumpkin stem increase the number of stitches equally until you reach 24 sc around. This may take another round or two depending on the size of your stem base. Step 4: You should now have the top portion of the pumpkin began and covering a majority (if not all) of your stem. If it is not covered, sc another round of 24 sts. 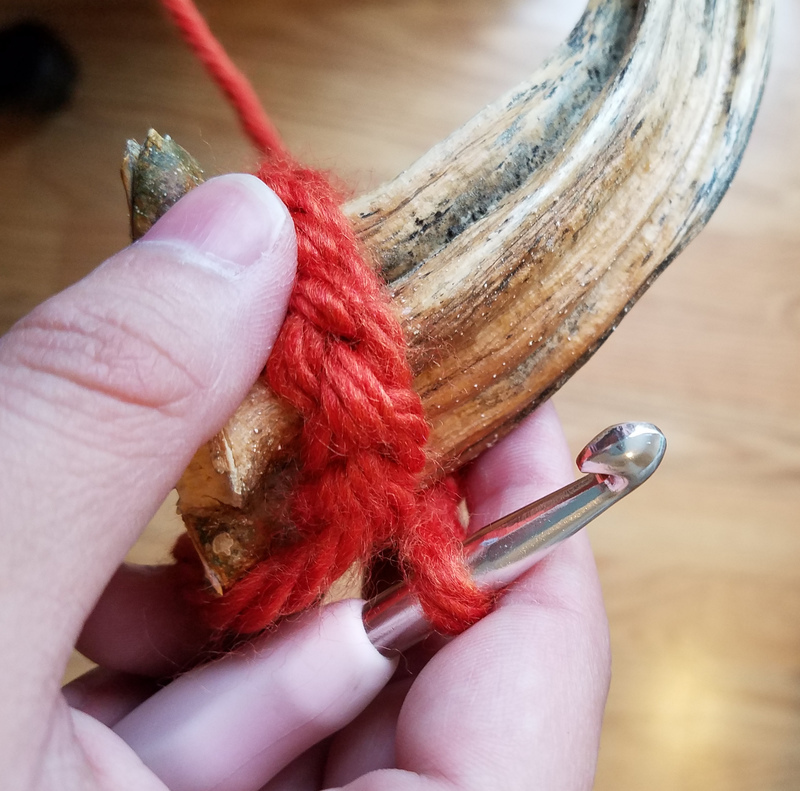 Once the base of the stem is completely covered by yarn you will take your hot glue gun and glue the stem in place to the yarn. Be sure to use as much glue as needed to keep the stem snug and upright. Now continue to work in increasing rounds to form the remainder of the pumpkin working off of the 24 sc around. Fill the pumpkin with polyfill stuffing here. Round 15: dec around until piece closes. Fasten off, but do not cut your remaining strand of yarn. Leave an extra long tail (Mine measured around 36 inches) to use for making the pumpkin ribs. Now you will take the pumpkin and begin to create the ribs using the long yarn tail at the bottom of piece. 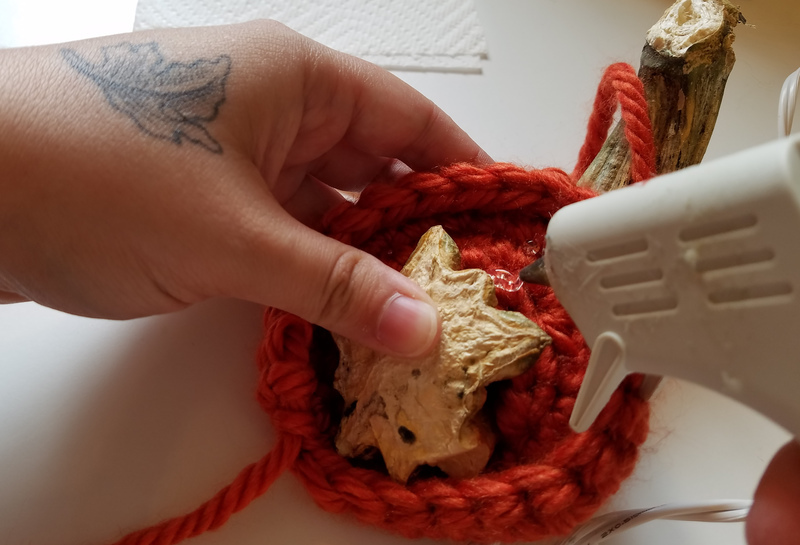 You create the ribs by taking the yarn tail upward towards the stem with your embroidery needle and feeding it down into the pumpkin to the bottom where you start. Pull through tightly to squeeze each rib into shape.. You should be able to create about 5 or 6 ribs total to give it a pumpkin appearance. Fasten off and weave in all ends. Ch 25 (increase or decrease depending on the length you’d like to achieve). Starting from 2nd ch from hook work your way down the ch piece by placing 3sc in each ch space. The piece will begin to curl and resemble vines. Sl st and fasten off leaving a long tail for sewing. Your possibilities are endless! Have fun! All designs & pictures are copyrighted by To Craft A Home 2017. Pattern is for personal use only and can’t be resold, republished, or redistributed in any way. You may sell the finished project if you so desire, but please give credit and link to my website http://tocraftahome.com and https://www.etsy.com/shop/ToCraftAHome.